As Mortgage Rates Rise, Homebuyers Face New Dilemma Homebuyers are on edge after a sudden jump in mortgage rates. Industry analysts wonder if the spike in rates will scare off potential buyers or push them into closing a deal before rates go up more. Mortgage interest rates have spiked recently, causing unease among potential homebuyers. A recent spike in mortgage rates has created a new predicament for potential homebuyers: Forge ahead and try to lock in now? Or hold off? Dhruv Gupta was quoted a 3.5 percent rate in May while searching for a place to buy in the San Francisco area. Less than two months later, he's looking at 5.2 percent for the same loan. But this trend has not deterred Gupta. "It's a fact of life," he says. "I mean I can't control them, so what do you do?" Over the weekend, Gupta bit the bullet and put a down payment on a two-bedroom condo in Oakland. It's so hard to find anything available and in his price range, he says, so he just went for it. He hopes rates will decline again, and that he'll be able to refinance. But for now, Gupta doesn't know how he feels about his decision. "I'm more anxious than excited because of the commitment," he says. Downstate in Temecula, Juan Johnson has had the opposite reaction to the market. "I learned that the interest rates had changed significantly enough where it made me reconsider my offer," he says. He was in the process of making an offer on a house when his loan officer told him rates had suddenly jumped half a percentage point from the last quote he'd received. "I was shocked," Johnson says. "You know, I said, 'You've got to be kidding me right?' And he said, 'Nope ... and they're supposed to continue to rise.' "
It was challenging enough trying to find a home his family likes, Johnson says, much less compete against investors making cash offers. Now, he's battling interest rates too. "Bummed would be a, uh, a kind way to put it," Johnson says. So, while Gupta jumped in, Johnson held back. Those differing reactions are reflected in the data as well. On one hand, the Mortgage Bankers Association says purchase applications rose 7 percent between early May and last week. But, according to the real estate website Redfin, the number of clients making offers declined more than 10 percent from May to June. Fewer people are requesting home tours, as well. 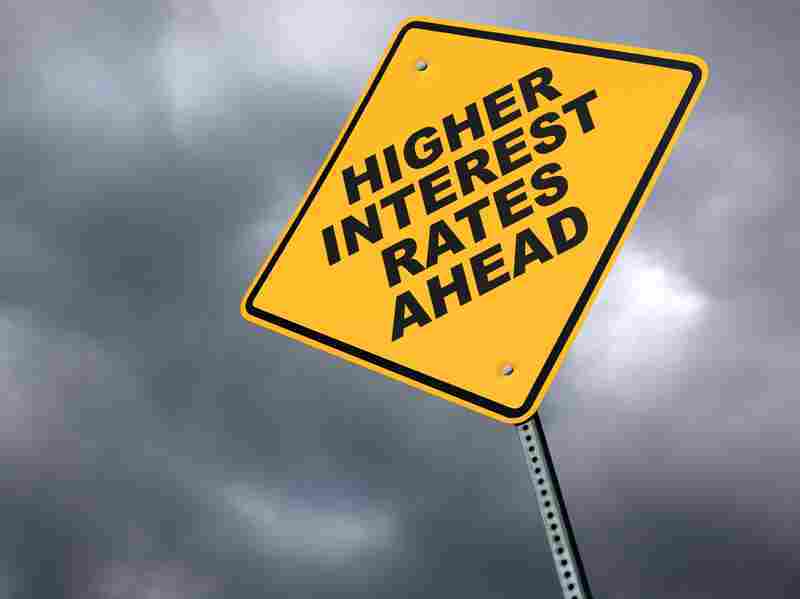 Market experts have long said rates would eventually rise, from their unprecedented 3 1/2 percent levels. But what touched off the jump was speculation the Federal Reserve would begin unwinding the stimulus programs that had been depressing rates. Then, on June 19, Fed Chairman Ben Bernanke put a specific time frame on it, saying the central bank would wind down one of its bond-buying programs by the middle of next year if the economy continued showing signs of strength. Investors reacted as if Bernanke had sounded a siren. "Almost as soon as the words left his mouth during that press conference, you had a big run-up in rates," says Michael Fratantoni, vice president of research for the Mortgage Banks Association. While interest rates are important, he says, job market stability and increasing home prices are more significant factors. And, he notes, demand isn't uniform. Applications for smaller loans have leveled off, but applications for jumbo loans of $729,000 or more are increasing. "One reason we're seeing a stronger jumbo market is that we've had a very strong run-up in the stock market," he says. "I think people are feeling wealthier." Dean Karlan, an economics professor at Yale University, studied how people react when interest rates change. He says people got accustomed to stable, very low interest rates in recent years. "But when you see a big jump, all of a sudden that wakes people up," Karlan says. Some people who've considered buying may hurry to pull the trigger. But, Karlan says, volatile interest rates also raise the psychological stakes for consumers, who feel added pressure to time the market right. "We tend to overweight the things that we've seen recently, and so we see this increase as a big increase, and it's attention grabbing," Karlan says. "But at the end of the day, rates are still quite low historically." In other words, it's better for homebuyers to try to forget where rates were, and not think about what might have been.